Did Bailey come to a decision about Alex? That was her plan on Grey's Anatomy Season 13 Episode 6, but how did she react to Catherine pressuring her into speeding it up? Meanwhile on this hit drama series, Amelia dealt with a challenging ER case on a difficult day. Also, a familiar face showed up in the hospital and threw a lot of the doctors into turmoil as they wondered what the person could want. 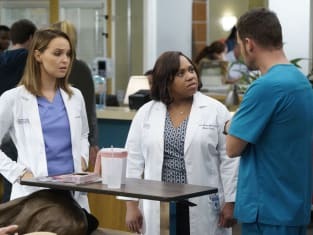 Use the video above to watch Grey's Anatomy online to get caught up with the latest developments. When I tell you to know your place, know your damn place. Permalink: When I tell you to know your place, know your damn place. Amelia: Owen, there's nothing to talk about. Owen: But you love to talk, and you're not talking about this at all. Permalink: But you love to talk, and you're not talking about this at all.